Scott Satterlee is a 26 year Special Operations Veteran with multiple combat tours, proven leadership capability. Scott retired out of 1st Special Forces Group in 2016 as the lead instructor and chief operations officer for the Special Forces Advanced Urban Combat Course. Scott grew up hunting in the Western states and started competing in NRA Service Rifle in the early 1990s. He continued to compete when possible in High Power, Small Bore and USPSA events throughout his military career. When Precision Rifle started to become popular he found his niche. Scott has been very active in the Precision Rifle Sport for the last 8 years regularly placing in the top ten in matches and as high as 15th in the PRS series. 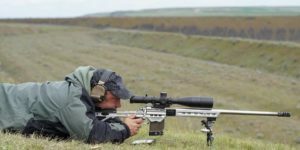 Scott has been developing course curriculum for Long Range shooting for the last 8 years focused on competition and hunting. The courses developed cover the entire spectrum of shooter requirements from beginner to advanced competition prep and high angle back country hunting.